......I've seen. A couple of questions/observations. The N and K are listed having an "emergency brake" (transmission brake) and hub brake, called the "service brake". On our N and K I use the hub brake first, using the transmission brake sparingly, primarily because I feel I'm saving on transmission wear. However, did Ford intend for the transmission brake to actually be the "emergency" only brake? 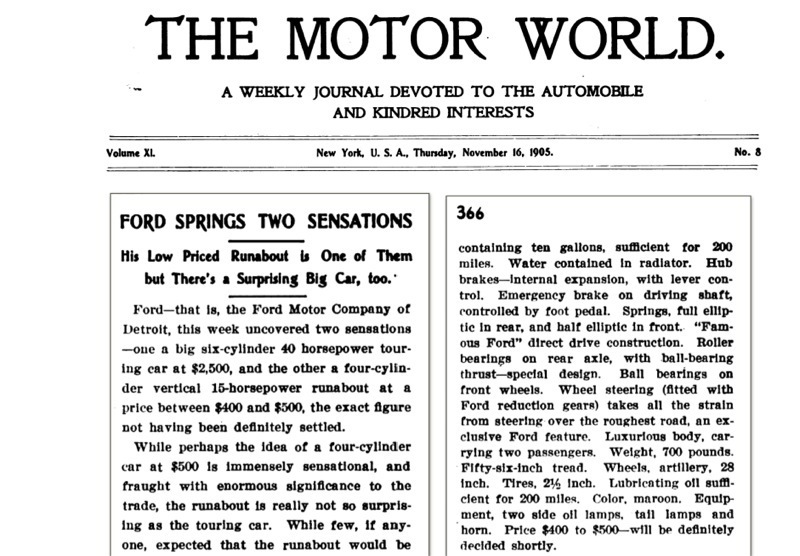 Secondly, the article mentions the trade had expected a $500 dollar (although it says the price has yet to be decided, between $400 and $500) runabout, but was surprised by Ford's six cylinder offering. The article also says the Model N will have a 78 inch wheelbase. When it reaches the market it (N) will have an 84 inch wheelbase. 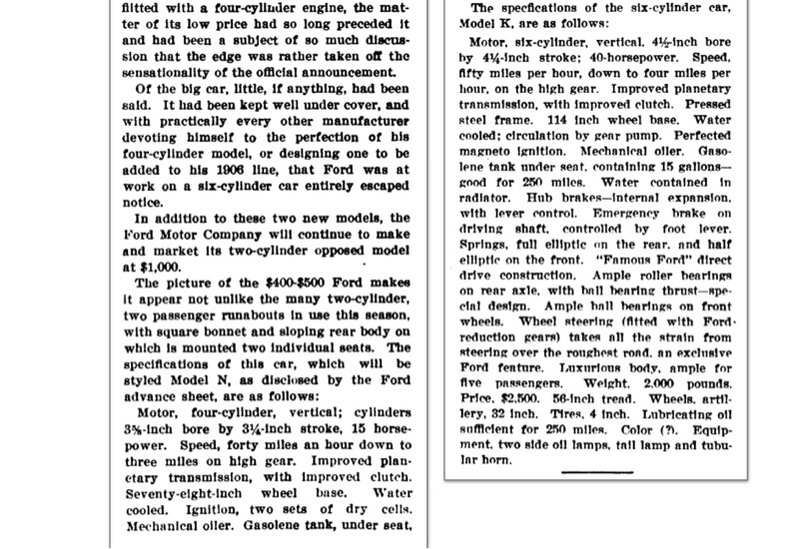 I thought this an interesting article about things to come from Ford Motor Company, several months before the cars are available on the market. Is there mention anywhere of what machine shop was building the six? I think common knowledge (we know that may be accurate or not) tells us the chassis (engine, front end and frame, I believe diff and torque tube/drive train) were provided by Dodge, on a month by month delivery schedule (January 1906 Ford Mo Co board minutes). Initially I assume the K was assembled at Piquet (although FMC also rented "space" at a Dodge Bros. facility at this same juncture, according to FMC board minutes). Later (mid 1907) Ford Motor Co. bought Ford Manufacturing, and changed the name of that facility (773 Bellevue St.) to the "Model K Assembly Plant". There are photos showing Model K at that site during assembly and testing. That's all I'm aware of at this point.